The trick to measuring small capacitance values is to get your body out of the loop: this fixture holds a crystal rigidly and makes solid contacts to both the case and leads while measuring the internal crystal-to-case capacitance. It’s sized for wire-terminated HC-49/U and HC-49/US cases, but you could obviously adapt it to other cases. 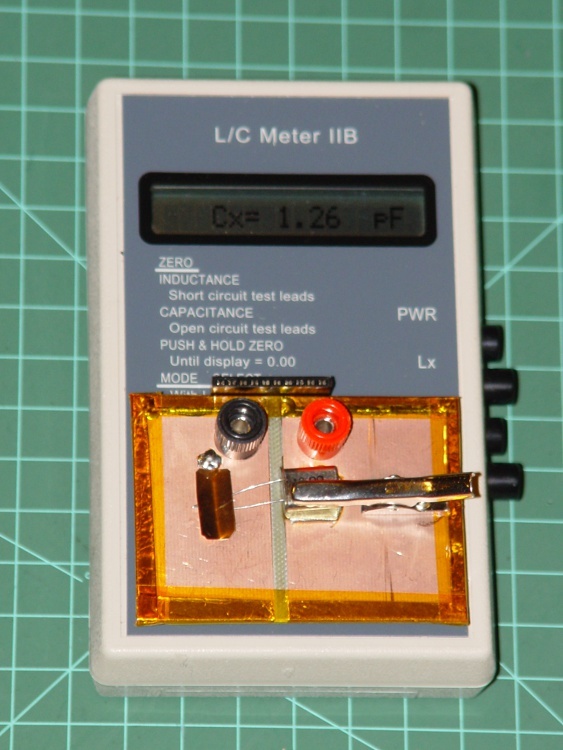 The meter is an AADE L/C Meter IIB, with binding posts on 3/4″ centers. The post caps are plastic, so the only reliable connection is on the bottom surface. I used double-sided 62-mil PCB material for the fixture base plate, with copper-foil tape wrapped around the sides and soldered along the top edge; the adhesive is allegedly conductive, but I suspect that’s for static dissipation and shielding, rather than for actually conducting signal current. 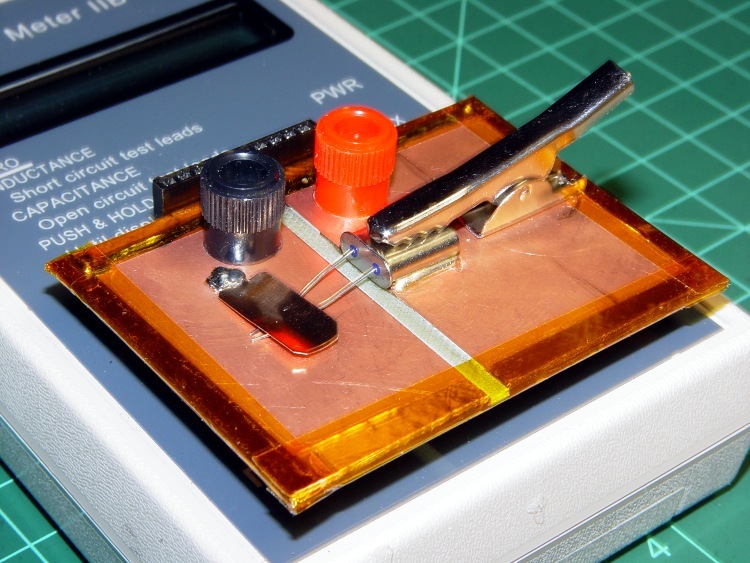 Kapton tape over the copper foil prevents gashes on the sharp edges. Run a 1/8″ end mill across (both sides of!) the PCB and drill 1/4″ holes with a step drill at the appropriate spots. A 25-mil brass shim stock rectangle soldered to the right half supports the crystal case to get the flange off the board. Slice up an alligator clip with a Dremel cutoff wheel, drill a hole in the board to mount it with the screw that’s supposed to secure its wire, and it’ll hold crystal cans down with grim determination. A snippet of phosphor bronze spring stock, bent in a slight arc with a tab soldered to the board at the far end, holds the crystal leads against the PCB. You could probably use brass shim stock. The black strip on the far side of the binding posts is half of a wire-wrap IC socket, leads bent & clipped appropriately, then soldered to the underside foil. That’s where you stick crystals to measure their lead-to-lead capacitance (aka Co or C0). Works fine for through-hole caps, too. Typical crystal case-to-lead capacitance is on the order of a few pF, so zeroing the fixture capacitance is important: (meter + fixture) weighs in at about 6 pF. There’s another half pF of crystal-lead-to-fixture capacitance that’s nullable by positioning the cap leads just over the spring contact when zeroing the meter. There’s essentially no stray capacitance due to a crystal in the socket strip along the back; zeroing the meter without the crystal seems to be adequate. I find that pressing the Zero button with a screwdriver while bracing the other side of the case with another screwdriver gives the best results; doing it with fingers produces about +0.5 pF offset. Done right, the meter reads within ±0.03 pF of zero and remains stable as long as you stay away while reading the digits! This entry was posted on 2010-04-24, 07:22 and is filed under Electronics Workbench. You can follow any responses to this entry through RSS 2.0. Both comments and pings are currently closed. In the picture, it looks like the crystal is soldered to the PCB? Is this true? Mind if I ask, especially since “Typical crystal case-to-lead capacitance is on the order of a few pF”, why is it important or interesting to measure? Nope, that’s the solder slobbering out from under the brass shimstock pad that holds the can far enough off the PCB that the flange doesn’t get in the way. why is it important or interesting to measure? There are two capacitances of interest: shorted-leads-to-case and lead-to-lead-with-case-floating. With those in hand you can derive the Co and Cc capacitance values you need for a circuit model. Then you do the spectrum analyzer trick I kludged there and conjure up the motional inductance, capacitance, and series resistance. Shazam: a SPICE model emerges! I just finished up a Circuit Cellar column on that and must write up a quick summary here, too.